The 3-in-1 ripstop bomber jacket provides durable high-visibility safety that stands up to even the most challenging work environments. Made from 300-denier ripstop polyester oxford fabric, it resists tears, snags and punctures from sharp objects, heavy materials and constant abrasion. The material features a polyurethane coating and sealed seams to give you 100 percent waterproof protection. The removeable fleece inner lining is black and features a poly-filled quilted design and dual lower cargo pockets. 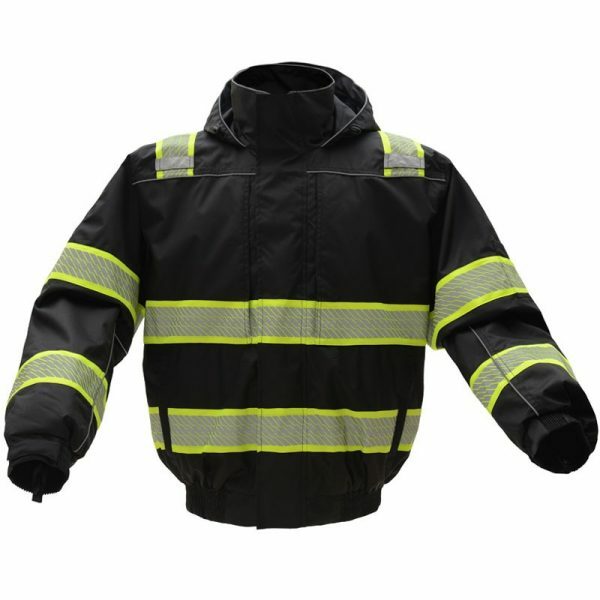 This jacket also features a unique teflon shield with fabric protector for added strength and resistance to oil, water and staining. This 3-in-1 Ripstop Bomber Jacket is ANSI Class 3 compliant and equipped with segmented reflective striping and reflective trim accents to ensure improved visibility in nearly any working condition. The zipper front closure has a storm flap to prevent water penetration, while the quilted fleece removable inner liner provides warmth for cold weather conditions. This hi vis bomber jacket comes with dual microphone tabs for easy hands-free communication. Zippered chest cargo pockets, sleeve pen/pencil pocket, and lower slash pockets provide ample storage for tools, papers, and personal items. Behind the microphone tabs is a hidden ID tag for quick identification. This black bomber helps to retain a clean look by hiding the appearance of grease, dirt and grime. Competitive pricing:We not only make sure our bomber winter safety jackets and other products are affordable, but we also offer a first-time shopping coupon. All you have to do is sign up! Advanced products: We’re interested in bringing you and your team only the best in safety, comfort, visibility and weather-resistance, and we guarantee satisfaction. Whether you need our 3-in-1 Class 3 winter bomber with segmented reflective stripe, pavement markings, maintenance products, signs or something else from our well-stocked inventory, you’ll find the most advanced, long-lasting products. Buying options: To add convenience for our customers, we make our products available both online and at our retail location. Rapid access: No matter which method you choose — shipping or in-store purchase — you’ll get your bomber safety jackets or other gear quickly. Buy it online for reliable shipping or try it on in stores and take it with you that same day. Reliable assistance: Every member of our staff is ready to answer your questions, offer advice and help you find the perfect gear for you, your team and your unique application — whether that’s the bomber winter safety jacket or another piece of equipment. Call us at (866-755-9794) to talk about item customization options. Once you’re ready, buy your bomber safety jacket today!